For an authentic Puglia experience, discover the small village of San Michele Salentino. The village sits in the countryside, surroundedby olive groves where you’ll be able to see the famous trullis, the conical houses for which Puglia is famed. 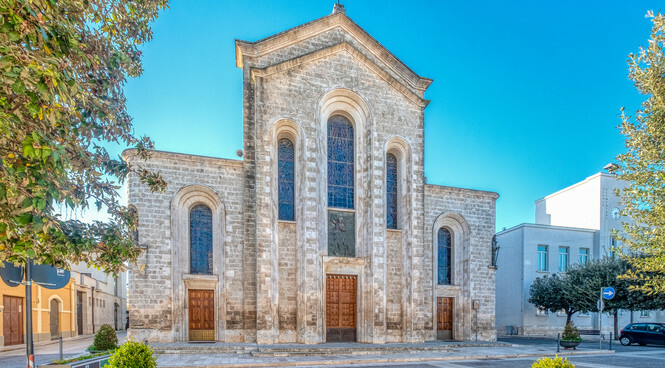 Stroll around the pretty town with its picture postcard views and savour the air, filled with fresh traditional Pugliese dishes being prepared. Every Thursday, the weekly market takes place right in the centre of San Michele Salentino. You’ll find everything from almonds, figs and Mediterranean vegetables to clothing and souvenirs. To find the best cheese selection and cold meat, visit the “Botteghe” or shops where there is also a wide range of pickles, Italian bread and pasta. All the bars and restaurant are around the bustling main square. ”Braceria” are the perfect place to enjoy your evenings. A wide range of roasted local meat are served with local vegetables. You can not miss “Polette & Braciole”, meatballs and rolled veal filled with cheese and ham in tomato sauce. There are also small bars serving Italian coffee and breakfasts, as well as a few cocktail bars for a pre-dinner drink. The city of Carovigno is a 15 minutes drive away renowned for its abundance of fine ingredients, there are plenty of restaurants to choose from and you'll find everything from appetisers and pizzerias to fine dining. The town of Ceglie Messapica in the opposite direction is only a 20 minutes’ drive away, with its narrow paved streets and lively Piazza Plebiscito, surrounded by traditional Italian restaurants serving fresh pasta and gelato. The Puglian coastline and beaches are renowned for their beauty and crystal-clear waters. You can either visit one of the private beach clubs where sunbeds are available for hire or explore the small coves which have limited facilities but plenty of charm. Don’t forget to pack a picnic! 30 minutes’ drive away is the Specchiola Beach with its fine white sand - perfect for relaxing and sunbathing in peace. Torre Santa Sabina beach is also 30 minutes’ drive away from San Michele Salentino with calm shallow waters and soft white sand. There are plenty of cafes and restaurants to enjoy a spot of light lunch or an evening dinner with sea views. For a day out with the family, the place to go is Carrisiland Aqua Park, situated 45 minutes’ drive South East. With an amusement and water park with swimming pools, slides and whirlpools, it’s great fun for the whole family. Unleash your Tarzan at the Ciuchino Birichino adventure park with cable cars over 200 meters, climbing vine’s, catwalks and zip trekking. Only a 20 minutes’ drive away. Alberobello, 30 minutes away by car, is famous for conical-roofed houses – trullo, which have UNESCO protection. It's a great place to wander around with its narrow pedestrianised streets, little shops selling local produce and souvenirs plus a few nice cafes and restaurants. 40 minutes’ drive away, you'll find Locorotondo in the Vale d'Itria, an area of countryside dotted with trullo and farms. It is well-known as one of the prettiest towns in Italy with flower pots and window boxes bursting with colour from many of the homes and restaurants. Ostuni, well known as "The White City" for the dazzling effect of its whitewashed houses. With its network of narrow lanes meandering through ornate buildings, prestigious palaces and churches, opening into piazzas - a great place to spend a day or night dining! Visit the Grotte di Castellana, one of the natural wonders of Puglia, where you can undertake a tour around the caves, lasting as long as around 2 hours. The entry will impress you even before you visit all of it with its 60 meters vertical tunnel and striking natural sculptures. For a day trip, Lecca city is about an hours drive away, with the finest baroque towns and churches as well as ancient ruins of a Roman amphitheatre. Explore the picturesque little lanes dotted with plenty of shops, bars and restaurants offering delicious, mixed antipasti. One of the most relaxing ways to visit the countryside around San Michele Salentino is definitely horse riding. A nice way to smell the Mediterranean breeze with, fruits, vegetables and aromatic herbs.